Yim Tse shows how to do calligraphy at a presentation. Photo courtesy of Dawn Tse. Fans, admirers and former students gathered on March 16 in the Dr. Sun Yat-Sen Classical Chinese Garden to commemorate the man they say has left a significant imprint on calligraphy and Vancouver’s cultural life. “His style and talent was idiosyncratically unique,” said Andrew Yang, Yim Tse’s student. 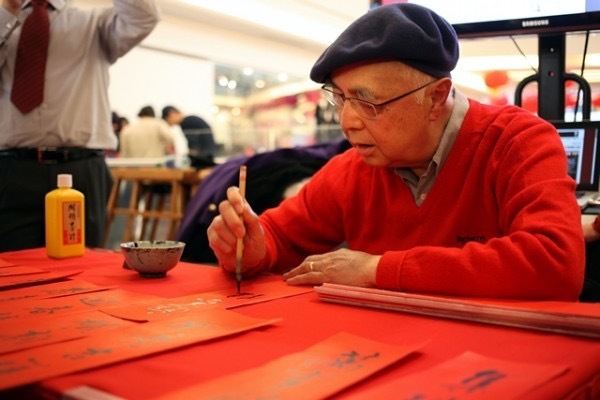 Calligraphy in China is considered a “supreme visual art form” and the importance of the art form in Chinese culture is “unmatched,” according to the website of the Asia Society. Margo Palmer, the current president of the Canadian Society of Asian Arts, said the calligrapher’s work has a lasting legacy. Students of the master said they hope to carry on his traditions. Yang said he believes Tse’s students learned more than just techniques, but also to appreciate the interactions among the strokes that form characters which then form a piece of work. 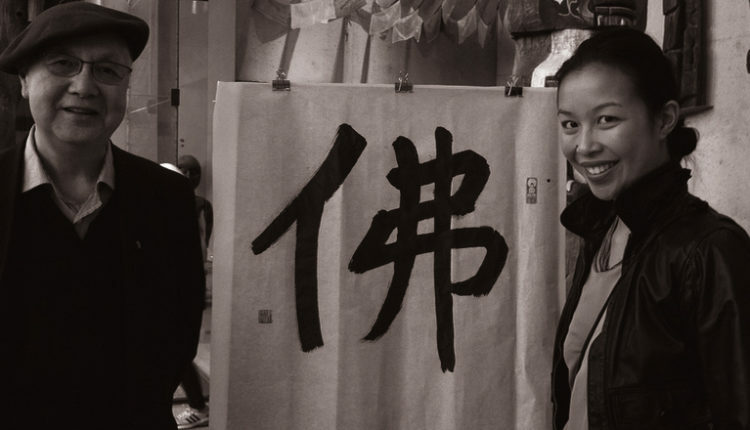 “The language and culture behind a piece of calligraphy comes not only from books and wisdom of ancient sages, but from observing life around you and being fully mindful,” Yang said. 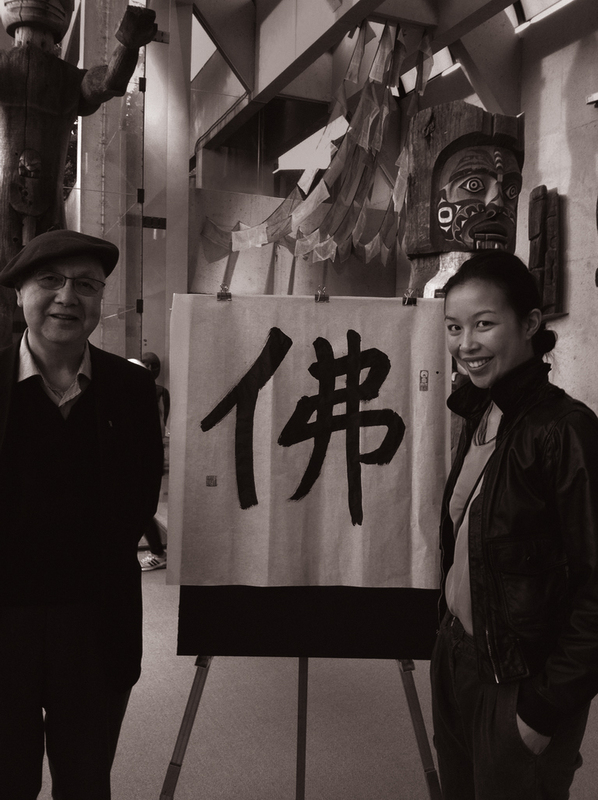 Dawn Tse said her father started to learn calligraphy after his mother’s death. “At the age of 29, he took up calligraphy as his way to channel his grief,” she said. Dawn Tse said her father began by teaching himself at first, and then two years later, he found a calligraphy teacher. Tse said that when people wanted to buy his art, her father felt uncomfortable taking their money. Yim Tse’s uncle Stephen Tse said that his brother practised and worked hard to learn the art form. “He really disciplined himself,” he said. Another legacy is the continuing work from students. Dawn Tse said she recently found a pile of letters from students her father taught from around the world. They “expressed gratitude for the gift of the calligraphy,” she said. 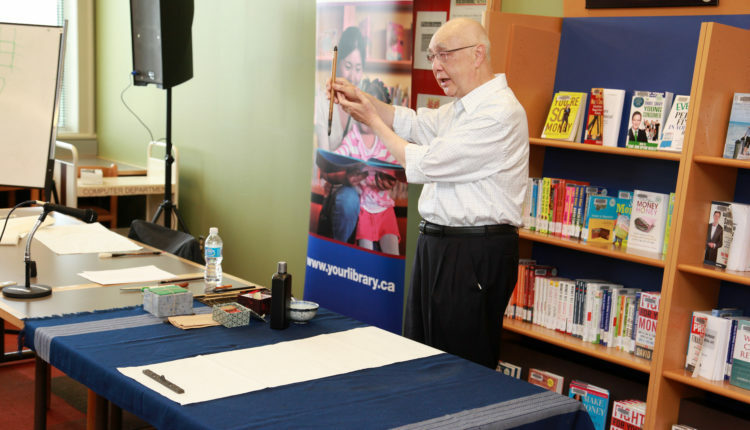 Jan Walls, past president for the Canadian Society of Asian Arts, said that Chinese calligraphy isn’t just an art. “It was right alongside poetry as a means of self expression and cultivation,” he said. The garden is holding a second event on Sunday, March 31, to discuss and demonstrate calligraphy. 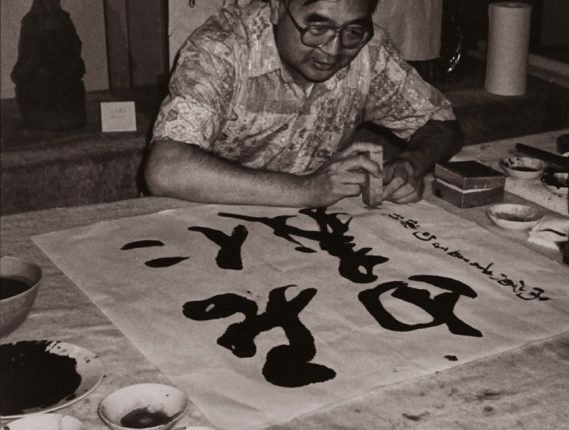 An old photo of Yim Tse practicing calligraphy. Photo courtesy of Dawn Tse. Yim Tse stands with his daughter beside a piece of his work. Photo courtesy of Dawn Tse. 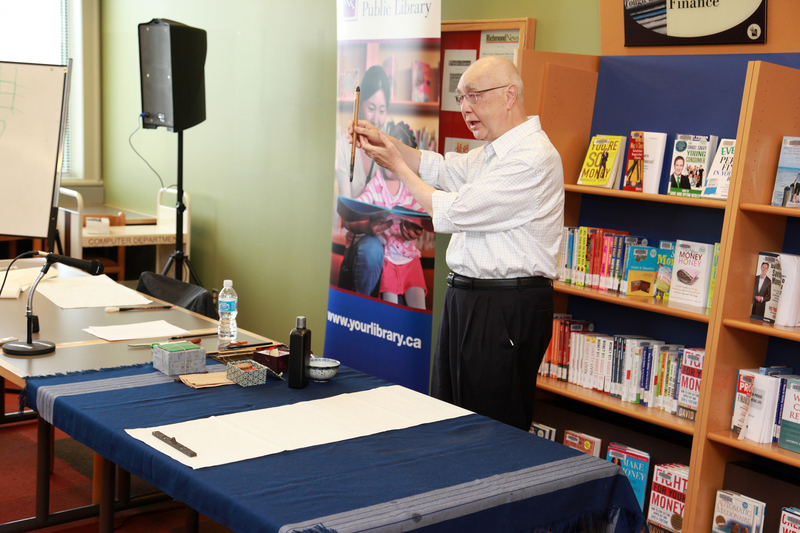 Yim Tse yields a brush at a calligraphy presentation. Photo courtesy of Dawn Tse. 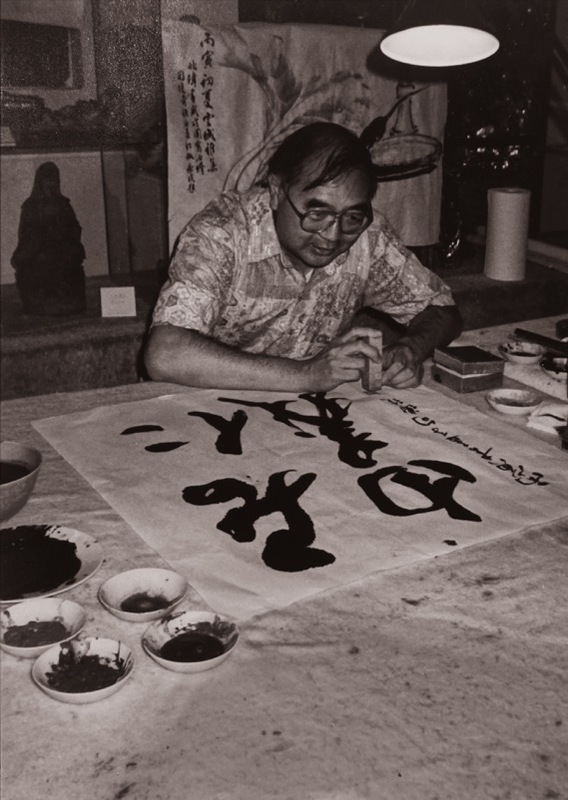 Yim Tse practices calligraphy. Photo courtesy of Dawn Tse.